Spots and stains happen at random times, and many times you can get rid of the stains with simple mixtures from products already in your home. Most people will just get a wet towel and try to rub the stain away, but this is something you shouldn’t do. Here are some instructions/ tips for dealing with general spots/stains in your home. There are also some directions for mixtures you can make at home to use as a cleaning solution. You can print this set of instructions out and leave it on the fridge for when you need to refer to them. If you take action while the spot is fresh, the chances of removal is over 50%. Remember not to iron or use hot-air on or around the stain until the stain is gone because heat will more than likely set the stain. Blot up as much of the liquid as you possibly can, and scrape up as much of the solids as you can as well. 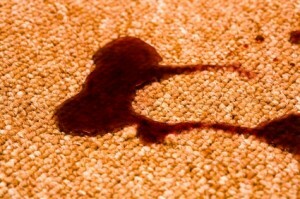 If available, you may use a wet/dry vacuum, but you must be careful not to spread the stain. Make sure that you experiment with any chemical you intend on using for stains. Try testing the chemical on a hidden area to make 100% sure that it will not damage the surface in any way. As you apply the chemical spotter, work from the outside of the stain in; this greatly helps you avoid spreading the stain. Use water to rinse out the chemical spotters, and then blot the area as dry as you can. You can then brush the pile. If you are dealing with carpet and upholstery, put a thick pad of toweling over the stained area, and weigh it down with something that is slightly heavy, and let it sit on top of the stain overnight to help the towel absorb the moisture. Use this mixture for common spills (juice, soda, coffee, tea, etc). Be sure to blot at the stain and start outside of the stain and work your way in. Use this mixture for urine stains and any other animal stains in your home. Be sure to blot at the stain and start outside of the stain and work your way in. Keep these directions handy, and follow them when a spill occurs. Never let the spilled food, liquid, urine spot or any other stain just sit there. The longer the stain sits there the higher the difficulty of removing the stain later on. Immediately attend to the stain right after the accident happens by following these guidelines, and you’ll have better chances of removing the stain(s).